Trinity Designs: The Cute Becomes Cuter! Have I mentioned lately that I love Target's $1 spot? Well, I LOVE Target's $1 spot! I always find the funnest things to spark my creative streak. 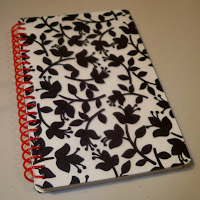 This notebook is already cute, I love the black and red, but it just NEEDED something, dontcha think? 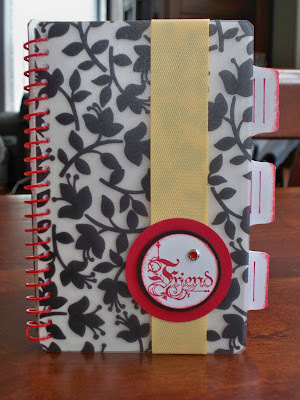 I divided the pages up in three sections and using my stamp set Totally Tabs, made tab dividers for the sections. I stamped in Real Red ink as it was the closest to the spiral coil on the notebook. These were folded up and attached with SNAIL, then the edges were sponged with some more red ink. Then, I used some of that beautiful So Saffron Poly Twill ribbon and wrapped around the front cover. It's attached with some Sticky Strip behind the circle embellishment so the seam wouldn't show. For the embellishment itself, I punched a 1 3/4" circle out of Real Red cardstock, then a 1 3/8" circle out of Basic Black cardstock. The top layer is Whisper White, stamped with the Friend stamp from "A Little Somethin'" in Real Red ink. It's punched out with the 1 1/4" circle punch and then edges with more red ink. Of course it wouldn't be complete with out a little bling so I added a red Rhinestone Circle Fire Brad to all the layered circles. Boom, bang, done! I love simple projects like this one and they make great gifts as well. It's amazing what you can do with a few stamps, ink, paper and ribbon! Happy Thursday, everyone! I'll be back tomorrow with my Blogger's Challenge post. This is super cute!!! And I know how you love your Target!!! Love all the colors and new touches on this project!! !